Last month I did some Christmas cards with a wonderful group of ladies. I wanted to do easy Christmas cards. This was not a ‘must have’ set for me when the Holiday Mini first came out but I have to say…this is really becoming a ‘go to’ set. It is really a great set for both simple and more detailed cards. One of the nice things about this card is that you could easily change up the colors and get a totally different look. Cherry Cobbler – 3 5/8 x 4 7/8, run through the Elegant Dots Embossing folder and add to Whisper White 3 3/4 x 5 and add to card front. Whisper White – 1 1/2 x 3 1/2, cut into a banner, stamp greeting using Versamark and Silver Embossing, add to card front using dimensionals. Silver Glimmer – 1/4 x 3 5/8, cut on an angle and add to banner. 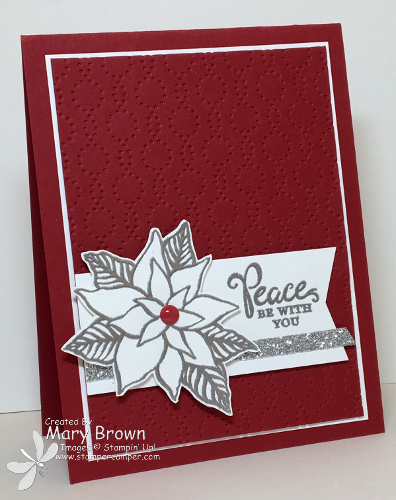 Stamp poinsettia on Whisper White using Versamark, silver emboss and cut out. Add using dimensionals. Add Home for Christmas red enamel dot to finish off. Guess what? 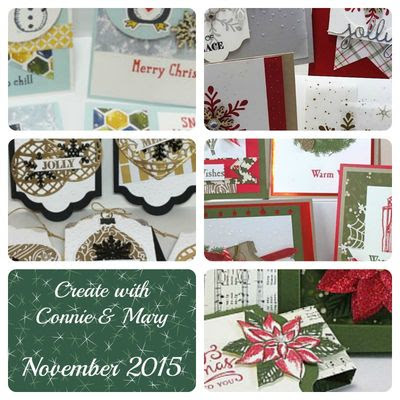 The new edition of Create with Connie and Mary November Mini Session is right around the corner! WOO HOO!!! And it really is beginning to look a lot like Christmas! As with previous editions, there are 3 card sets an two 3D projects along with a bonus card set! Just take a look at the fun little snippets..such fun! So check it out at Create with Connie and Mary! Mini session releases November 11th! Oh…and we have a SPECIAL BONUS if you sign up for BOTH November AND December! This entry was posted in Holiday Mini and tagged Reason for the Season. Bookmark the permalink.